So much for the kids to do here! Mine enjoy the reptiles, turtles and the bunny in the kids center. Manicured grounds, lush foliage and a winding road create a great first impression. Posh rooms with custom furniture and fine amenities ensure a luxurious stay. Expect first-class service. There's something for everyone at the resort, including a renowned golf course, several pools, a health club and a world-class spa with numerous services. Adults can indulge in spa time after hitting the links while the children enjoy time at Ritz Kids. Each room includes a balcony with beautiful views of the grounds. 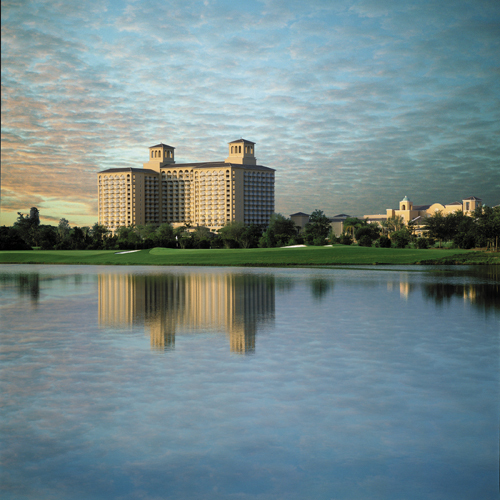 The hotel is expansive and shares its facilities with its sister property, the JW Marriott Orlando, Grande Lakes. Smoke free premises. 582 units, some two bedrooms. 14 stories, interior corridors. I-4 exit 71, 2.8 mi e. 4012 Central Florida Pkwy 32837. 6 restaurants, also, Highball & Harvest, NORMAN'S, see separate listings, full bar. coffeemakers, safes. Fee: high-speed Internet, wireless Internet. sauna, hot tub, steamroom, cabanas, self-propelled boats, fishing, regulation golf, tennis, recreation programs, kids club, bicycles, playground, game room, lawn sports, trails, health club, spa. valet laundry, boarding pass kiosk, rental car service, airport transportation, room service, area transportation-selected attractions. check-in 4 pm, 5 day cancellation notice-fee imposed, resort fee, pet friendly (call for restrictions/fees. ).